A nice, colorful template with its bordering lines above and below each section heading can be customized to display your favorite colors for both the borders and text. Your contact details are aligned to the left with your name written with a larger font size. There are plenty of methods for the employer to contact you about the job. They can pick from your street address, email address, two separate telephone numbers and a web address for your LinkedIn profile. Whichever the employer deems to be compatible with their hiring process. The sections have heading titles that are capitalized to quickly discern that what is contained in each section. The business and school names are listed first with the date on the right side. The employer can scan down the right side to get a quick read of how stable your employment dates are. Your job titles and degree titles are bolded to make them more apparent. We have several templates that also use borders like this, numbers 3, 4, 27 and 28, numbers 27 and 28 have provisions to display a monogram or picture. If you like this look you may want to check out those styles too. Your goal is to include as much relevant information that you possibly can while still keeping the length limited to one or two pages. This can be accomplished by using several strategies. Pick a template that has a sufficient level of "compactness" to arrange everything in such a way that it uses the real estate of the page efficiently. Pick a smaller font size or more compact font face. And lastly cut out the less pertinent facts fine-tune them to using the most powerful facts. 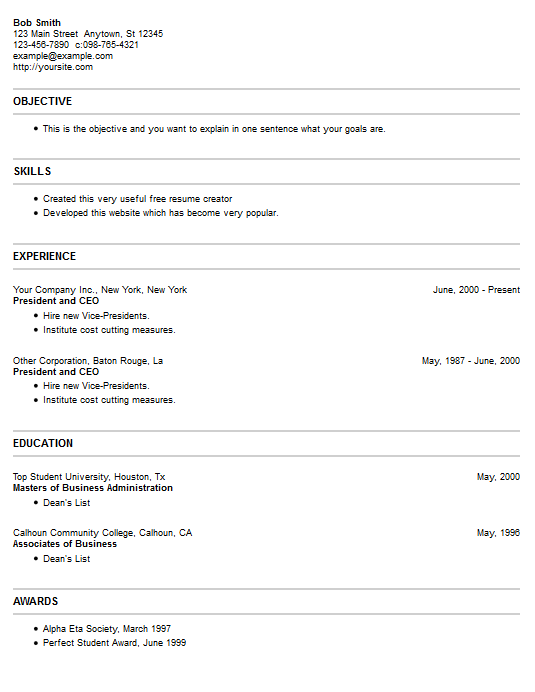 Acquire this style fourteen template from our resume builder program.